3 CD deluxe editon set of 2008 release of Bob Dylan Vol. 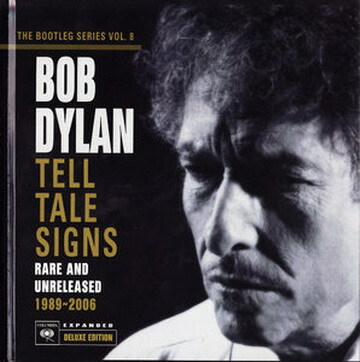 8 Tell Tale Signs: The Bootleg series with rare and unleashed material from 1989 - 2006. A treasure-trove of 39 songs spanning 3 discs, Tell Tale Signs features previously unreleased recordings and alternate versions of tracks from sessions which generated some of Bob Dylan's most acclaimed and commercially successful albums from the last two decades, including Time Out Of Mind, 'Love And Theft', Modern Times and Oh Mercy. Tell Tale Signs is perhaps the most appropriately titled of all the volumes in Bob Dylan's official Bootleg Series thus far. Containing 27 tracks, the material here dates from the albums Oh Mercy through to 2006's Modern Times. It presents a carefully prepared sonic treat of a genuine enigma's musical world-view. Dylan may be an icon, but if it wasn't already obvious, he seems to perceive the modern world as a strange place that he no longer understands, nor wishes to. The music here is startling in its depth and presentation. It begins with one of the two versions of "Mississippi" included; the song first appeared on Love and Theft, but was written for the Time Out of Mind sessions five years earlier. This one, with only Daniel Lanois' electric guitar as backing, shows Dylan in full voice, and performing it as a midtempo blues. It's jauntier in tempo, but harder, leaner, and wearier than the released version. Even more shocking is "Most of the Time," which has become a signature of Lanois' production style with its warm, thickly padded guitars and muffled drums. This one features Dylan solo with harmonica and guitar. It comes off as a statement of actuality about strengths and weaknesses rather than as a treatise of denial in the aftermath of lost love. It feels like a back-porch country song here, with different lyrics that underscore the singer's steely determination. There are some truly amazing stops along the way. The unreleased "Red River Shore" would have shifted some of the darkness on Time Out of Mind to some declaration of empathy and even tenderness had it been released. Likewise, "Marchin' to the City," one of the best slow blues Dylan has ever written, offers a respite from the desolation on that album. Soundtracks get represented, too: the alternate take of "Tell Ol' Bill," from North Country, is a semi-rag tune with rambling honky tonk piano, and "Huck's Tune," from Lucky You, creates a more complex look at the male lead in the film with a Celtic undertow in the melody. Disc one closes with a burning live reading of "High Water (For Charley Patton)," with overdriven electric guitars replacing the banjo. A real surprise on disc two is a dynamite reading of Robert Johnson's "32-20 Blues" that was originally recorded for the covers-only World Gone Wrong, but left in the can. A completely unreleased tune, "Can't Escape from You" portrays Dylan the folksinger as a lover of early rock & roll ballads. In his own wrecked way, he pays homage (in waltz time) to the Platters, Doc Pomus, Leiber & Stoller, and Cisco Houston with a lonely B-3 and trebly guitars. There are two takes of "Dignity" here as well (one on each disc), the first a prophetic gospel solo piano version and the second a full-band roots rock rave-up. The version of "Ring Them Bells" recorded live at New York's Supper Club is so utterly moving that it raises goosebumps and leaves the studio version in the dust. The disc closes with the greatest moment on the whole set: "'Cross the Green Mountain," from the Gods and Generals soundtrack. Veteran Dylanologist Larry Sloman claims in his truly brilliant and incisive liner notes that this "might be his finest hour as a songwriter." The amazing thing? It's not just hyperbole. In all, even in some of its familiarities, Tell Tale Signs feels like a new Bob Dylan record, not only for the astonishing freshness of the material, but also for the incredible sound quality and organic feeling of everything here. It's a carefully presented set, but it's full of life and crackling energy and offers yet more proof -- as if any were needed -- that Dylan remains as cagey, unpredictable, and yes, profound and relevant as he ever was. free download Bob Dylan - The Bootleg Series Vol 8 - Tell Tale Signs - Rare and Unreleased 1989-2006 (2008).Bob Dylan - The Bootleg Series Vol 8 - Tell Tale Signs - Rare and Unreleased 1989-2006 (2008) full from nitroflare rapidgator uploaded turbobit extabit ryushare openload littlebyte zippyshare.